This past weekend, former and current NHL players came together at the Scotiabank Convention Centre in Niagara Falls, Ontario, for a Parkinson’s disease fundraiser. 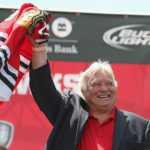 As part of the fundraiser to help raise money and awareness for Parkinson’s, the players joined in on a roasting of NHL legend Bobby “the Golden Jet” Hull. Steve Ludzik, a former NHL player and coach living with Parkinson’s, plays a big role in putting the event together. As someone who always speaks up for the players and is respected around the league, the players returned the favour Friday night by showing up to help raise money towards the Hotel Dieu Shaver Foundation – Steve Ludzik Centre for Parkinson’s Rehab in St. Catharines, Ontario. “Hockey players have a strong sense of history and they battle each other tooth and nail, but when they get off the ice they get along well. They’re a unique blend of athlete to say the least,” said Ludzik, who has been living with Parkinson’s disease since 2000. Ludzik, who comes from a family with no history of Parkinson’s, believes that his career as a professional hockey player played a role in his current condition. Keith Primeau, a player who had his career ended by ongoing post-concussion syndrome, believes that Ludzik might be onto something. “I would agree with Steve on that and it takes a lot of courage to stand up and say that, especially since there isn’t a whole lot of documentation to prove that fact,” stated Primeau, a former 1st round pick of the Detroit Red Wings. Keith was in attendance with his brother Wayne, who played for Steve when he was a member of the Tampa Bay Lightning. Keith said that once they got the call, they felt it was important to support Steve and his cause. While plenty of NHL Alumni were on hand for the event, there were also some current faces in attendance like Zenon Konopka, a member of the Minnesota Wild who has been a part of the event in previous years. “It’s fantastic to have this in my backyard, said Konopka, a St. Catharines, Ontario native. “We do a lot of charity stuff up in Toronto and Montreal, but to give back and to do something in Niagara, it’s great. Everything is first class about the weekend and it’s great to be a part of it again,” he continued. “This event is absolutely fantastic, just to be on the bus with some of the guys and hearing some of their stories. I was telling a couple of the guys the stories that weren’t here last year about how we were playing pool and Walter Gretzky came in and he was telling stories until 4 in the morning. It was like being a kid in a candy shop,” he concluded as a smile lit up his face. David Clarkson, one of the newest members of the Toronto Maple Leafs, was also on hand for the event. As he gets ready for his first season as a member of the Maple Leafs, Clarkson believes that playing closer to home is going to have a positive influence on him in terms of getting out into the community more often. With more than 50 former and current players, officials and others from the hockey community coming to town to support Ludzik, it is obvious that hockey players and those who love the game have a mutual respect for one another, even if they may dislike each other on the ice. They may not know exactly what Steve Ludzik is dealing with on a daily basis, but they do know that they can help in many different ways. They know that just by showing up it makes a difference and the more awareness they can raise, the better. “These events are going to raise money for a good cause and that’s what it’s all about,” said 1985 Hockey Hall of Fame inductee Gerry Cheevers. Each year the event continues to grow and with Ludzik and his friends in full force to fight against Parkinson’s disease, there’s no telling how many positive things they are going to be able to do for others living with the disease.